Another in an occasional series on memorable Boston sports figures who had their 15 minutes of fame. MOBILE, Ala. — Bernie Carbo launched the greatest pinch-hit home run in Red Sox history. He admitted he was high on drugs during the 1975 World Series. “I probably smoked two joints, drank about three or four beers, got to the ballpark, took some [amphetamines], took a pain pill, drank a cup of coffee, chewed some tobacco, had a cigarette, and got up to the plate and hit,’’ Carbo said. The Sox were four outs from elimination against Cincinnati’s Big Red Machine in Game 6 when Carbo came off the bench to smash a three-run home run into the center-field bleachers, tying the score at 6-6. The blast set up Carlton Fisk’s arm-waving, 12th-inning walkoff home run for the ages. Drugs, alcohol, and temptation were his downfall. “I played every game high,’’ he said. “I was addicted to anything you could possibly be addicted to. I played the out field sometimes where it looked like the stars were falling from the sky. 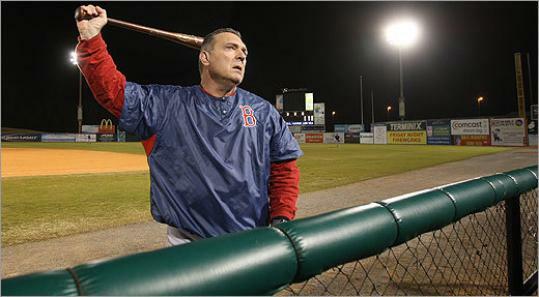 Carbo, who conducts a fantasy camp each year at Hank Aaron Stadium in Mobile, Ala., that combines baseball and gospel, in 1993 founded the Diamond Club Ministry, a Christian evangelical organization. He played for six major league teams in his 12-year career, and he batted .264 with 96 home runs and 358 RBIs in 1,010 games. But he was out of baseball by age 33. Carbo, who said he hasn’t touched alcohol or drugs in 15 years, travels throughout New England every summer preaching at youth camps, 12-step programs, prisons, and churches. He uses the nominal money from his fantasy camp to pay expenses. But Carbo’s career opens a window to a time of widespread abuse of alcohol and drugs in baseball. “When I came to the big leagues in 1970 with the Big Red Machine, the trainer told me, ‘You need to take these vitamins,’ ’’ Carbo said. Carbo gobbled them down. He hit .310 for Cincinnati manager Sparky Anderson and was The Sporting News Rookie of the Year. He would never do better. That was the beginning of the end, Carbo said. “The Cincinnati organization trainer was giving me speed, so I never played a game without it,’’ he said. “Then he started giving me pain pills. Then when I couldn’t sleep, he was giving me sleeping pills. So I got to the point where I couldn’t play without any of them. “I was introduced to marijuana in 1969. There were a lot of lowlights. In 1975, Carbo awoke in a rain-soaked Chicago gutter at 5 a.m. with a car tire nearly touching his feet and another just inches from his head. All Bernie Carbo ever wanted to be was a baseball player. He was born in Detroit, where his father played minor league ball and worked in the steel factories. The elder Carbo was an adulterer and a batterer who never told his son he loved him. Carbo said an older cousin sexually abused him when he was 9 years old. “My mom said, ‘We won’t ever talk about this,’ ’’ he said. The Sox acquired the lefthanded-hitting Carbo and Rick Wise in October 1973 from the Cardinals for Reggie Smith and Ken Tatum. Carbo was one of the most popular Red Sox players. Charismatic and colorful, he was part of the fun-loving “Buffalo Heads’’ with Bill Lee and Ferguson Jenkins. He had a giant stuffed gorilla named Mighty Joe Young and traveled with him. The two were inseparable. The gorilla sat next to him in the middle seat on planes. Carl Yastrzemski wanted the gorilla placed on the bat rack in the dugout. “Yaz said we were winning and hitting,’’ said Carbo. In the 1975 Fall Classic, the Sox were underdogs against the Reds of Johnny Bench, Pete Rose, Joe Morgan, and Tony Perez. Carbo was on the bench for most of it. His old Cincinnati teammates were sympathetic. Pitcher Clay Carroll inscribed a picture for him: “Good luck in the World Series.’’ But when Carbo blasted a pinch-hit homer off him in Game 3 at Cincinnati, Carbo returned later to find his locker ransacked. “They told me Carroll was in here and just went crazy, ripping up the picture into little pieces,’’ said Carbo. Game 6 was postoned three days because of rain. Carbo did not take batting practice at Tufts University because he said he couldn’t find it. He spent the early part of Game 6 working on his Louisville Slugger. In the bottom of the eighth inning, there were two on and two outs. With pitcher Roger Moret due up, Red Sox manager Darrell Johnson told Carbo to get ready. When Carbo tells the story, the fantasy campers get quiet. On the next pitch, Carbo guessed fastball and got all of it. Late that evening, Carbo’s joy was mixed with pain. The Red Sox acquired and shipped out Carbo twice. When Yawkey died in 1976, Carbo said he wept. Meanwhile, Carbo was wearing down. He said that in 1978, new Sox owners Haywood Sullivan and Buddy LeRoux hired a private detective to follow him. They didn’t have to look far for evidence of drug use. Carbo was in the outfield at Fenway Park during batting practice, tossing baseballs into the bleachers to fans who threw him marijuana joints. Carbo was eventually sold to Cleveland in June 1978. The move prompted Lee to call the Sox “gutless’’ and stage a walkout. “I don’t blame anybody but me, it’s my loss,’’ said Carbo. But he said he wasn’t the only one on that team doing drugs. His big league career ended in 1980 with the cocaine-racked Pittsburgh Pirates. Carbo went to cosmetology school and opened a hairdressing salon. In 1985, in a federal drug distribution trial, former Cardinal Keith Hernandez said Carbo was the man who introduced him to cocaine in 1980. Carbo said he subsequently lost his house and his salon because of the bad publicity. While playing in a senior league in St. Petersburg, Fla., in 1989-90, Carbo hit rock bottom. His mother had committed suicide, his father died two months later, and his family was disintegrating. He was spending $32,000 a month on drugs, mostly cocaine. One day, at a hotel across the street from the ballpark, he staggered bleary-eyed to the swimming pool. “I wanted to drown,’’ he said. “And I prayed to take Jesus into my life,’’ said Carbo. But Carbo couldn’t break his addictions. “I just kept druggin’, druggin’, and druggin’ and contemplating suicide,’’ he said. Eventually his old Buffalo Head teammates came to the rescue. Jenkins, a Hall of Famer, put him in touch with Sam McDowell, who is a counselor for the Baseball Assistance Team, which provides emergency assistance to baseball players in dire straits. Carbo entered rehab in Tampa, but had a panic attack. Together they studied the Bible. Carbo said his life is more fun now. He moved to Alabama and met his wife, Tammy, a school counselor. It didn’t happen overnight, but the resurrection of Bernardo Carbo continues. He has three grown daughters from a previous marriage who were incarcerated for either drugs or bad checks. He and his wife have custody of his three grandchildren and are raising them in his Theodore, Ala., home. He managed the Pensacola Pelicans for three seasons, then decided the Lord wanted him doing his ministry full-time. “To watch people come back to the Lord, it’s better than hitting that World Series home run in 1975. Guaranteed. Ten times. Hundreds of times better,’’ he said.